Abstract: The paper examines cultural frame-switching among bicultural participants at the level of associated meanings. Bicultural participants of Greek descent who live in the Netherlands were randomly primed with either Greek or Dutch cultural symbols and language. A monocultural Dutch group in the Netherlands and a monocultural Greek group in Greece, were involved as control groups. Structural equation modeling indicated that the Greek participants in Greece and the bicultural participants primed with Greek culture had a similar pattern of associations. This pattern differed from that of the Dutch participants and the participants primed with Dutch culture. Thus, the two different monocultural association patterns were replicated among bicultural individuals. The findings show that meanings are affected by cultural frame-switching, and provide further support for the dynamic constructivist approach. Cultural frame switching, attributions, self-identification and attitudes. 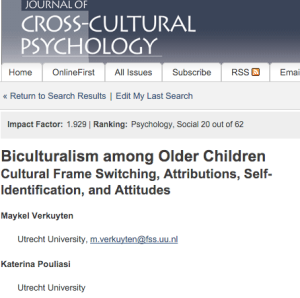 Abstract: This study examines cultural frame switching among bicultural children between the ages of 9 and 12 living in the Netherlands. By means of experimentally primed bicultural children and the use of monocultural comparison groups in the Netherlands and Greece, it was demonstrated that social explanations, self-identification, and attitudes toward family integrity and obedience were affected by cultural identity salience. Compared to Dutch identity salience, activating Greek identity especially led to more external attributions, stronger identification with friends, a more positive evaluation of social identity, and a less positive evaluation of personal identity. Similar tendencies were found for the attitude measures. In addition, similar differences were found when comparing monocultural Dutch and monocultural Greek children. It is concluded that this kind of experimental study and its results help to improve>our understanding of the experiences of bicultural individuals and the way culture influences people’s lives. 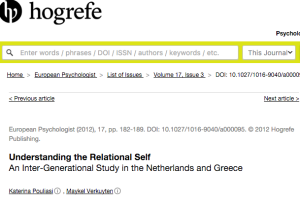 Abstract: In the context of Greece, the authors examined psychological correlates of individualization. In Study 1, the Greek context was compared to the Netherlands, and Study 2 focused on Greece and examined individual differences in self-descriptions. In Study 1, a distinction between Greek “neo-collectivist” and “collectivist” participants could be made. For both subsamples, the collective self played a key role in psychological well-being. In addition, for the “neo-collectivist” participants, it was the combination of high personal and high collective self-evaluation that predicted psychological well-being. The second study examined individualism in Greek society at the level of self-descriptions. The results were in agreement with the first study. Only for participants relatively high on individualism was higher personal self-evaluation related to higher collective self-evaluation and to global self-esteem. Taken together, the findings indicate that individualization in the Greek context increases personal self-evaluation but without changing the positive evaluation of the collective self and its central role in well-being. Understanding the relational self. An inter-generational study..
Abstract: This study examines spontaneous social self-representations in two different cultures (the Netherlands and Greece) and among adults and early adolescents. A distinction between three levels of the social self is made: the relational self, the communal self, and the collective self. Supporting the notion of the general primacy of the relational self the findings show that the relational self is the most prominent and important one in both cultures and among both age groups. Yet, there is a cultural difference in the cognitive representation of the relational self. In the Dutch context, participants tended to understand their relational self in terms of a personalized or dyadic mode of connection (pair-wise mode). In contrast, in Greece participants understood their relational self in terms of units of significant others (group-wise mode). 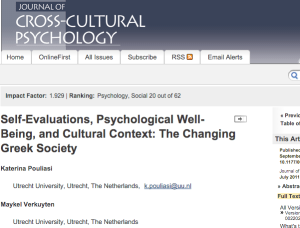 Implications for the relationship between culture and the self-concept are discussed. The mediating role of identification in cultural frame-switching. Abstract: This article discusses a study that examined cultural frame switching among bicultural Greek participants living in the Netherlands. The research demonstrated that self-evaluations,self-stereotypes, and attitudes toward family integrity and friendship were affected by cultural framing. Experimentally primed bicultural participants and monocultural comparison groups in the Netherlands and Greece were used. Activating Greek culture especially, in comparison to activating Dutch culture, led to a less positive evaluation of the personal self, stronger Greek self-stereotyping, and stronger endorsement of family integrity and friendship. Similar differences were found when comparing monocultural Dutch and monocultural Greek participants. In addition, cultural priming affected group identification, which was found to be associated with perceptions and attitudes. 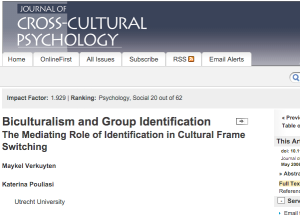 The pattern of results suggests that group identification, in part, mediates the relationship between cultural framing and perceptual and evaluative responses. It is concluded that social identity principles are important for understanding the experiences of bicultural individuals.